Pelatiah "Ty" BOND (pictured at right) enlisted on 22 April 1861, in Co. G of the 8th Reg. Ind. Vol. Inft. for three months. On the 28 of Aug. 1862 he entered the service in B Co., in the 2nd Regiment Indiana Cavalry (41st Regiment Volunteers). He transferred on 14 Sep. 1864 from Co., B to Co., D. He was mustered out on 25 Jun. 1865. During the war he married Cornelia "Nellie" EDWARDS. Hezekiah BOND enlisted 14 Aug. 1862 at the age of 27. He was a Private in F Co. 1st. Inf. MN. Reg. 22 Aug 1862 he transferred to B Co. 1st. Battn Reg. MN. He participated in the Battle of Gettysburg & others . He died 26 Oct. 1864, a P. O. W. at Salisbury, N. C.
Benjamin BOND first enlisted 22 Apr. 1861 in Co. G of the 8th Regiment Indiana Volunteer Infantry in the three months term of service & was mustered out 6 Aug. 1861. He then enlisted 18 Aug. 1861 in Co. F, 3rd Regiment Indiana Cavalry (45th Regiment Volunteers). He died 25 Nov. 1861, at Budd's Ferry, MD. Daniel BOND (pictured at right) enlisted and served in F Co. 1st. Inf. Reg. MN. 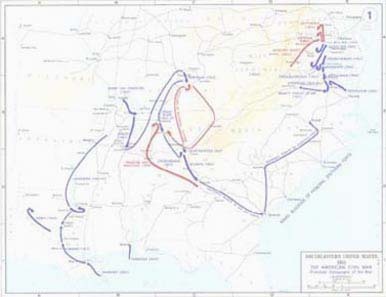 on 22 Aug. 1862. He participated in the Battle of Gettysburg & others . After being wounded at the battle of Fredericksburg, he was reassigned to Co. B. 1st Bat. He was captured near Petersburg & confined in Andersonville Prison in Jul. 1864, and escaped in Mar. 1865. He was mustered out of the Army on Jul. 24, 1865, as a corporal. Daniel Bond's Recollections, are on microfilm & can be borrowed via Interlibrary Loan from the Minnesota Historical Society: Reference Services, Division of Archives and Manuscripts, Minn. Historical Society, 1400 Mississippi St., St. Paul Minn. 55101. Also visit the First Minnesota Volunteer Infantry Regiment website. Edward BOND enlisted 6 Feb. 1865 at the age of 19. He served in Co. E, 1st Minn. Heavy Artillery. Ellen (GOLDSMITH) BOND the mother of the BOND Brothers. Cornelia "Nellie" EDWARDS was first the girlfriend of Benjamin BOND. They met while he was teaching school in Hamilton Co. IN. After Benjamin death Cornelia & Pelatiah started writing to each other, they became good friends then got married during the war. William Bolton EDWARDS older brother of Cornelia. He enlisted, 28 Aug. 1862. He served in B Co., of the 2nd Ind. Cavalry. Transferred on 14 Sep. 1864 from Co., B to Co., C. Spent months in Andersonville prison, and when he was exchanged was too ill to get home. He died in a hospital in Annapolis, MD. His brother Robert brought his body back to IN. John Simpson EDWARDS (pictured at Right) older brother to Cornelia & twin of William. First enlisted 22 Apr. 1861 in Co. G of the 8th Regiment Indiana Volunteer Infantry then he enlisted, 20 Sep. 1861 & served in the B Co. of the 2nd Ind. Cavalry. He was promoted to Full Capt on 26 Dec. 1861 & then promoted to Full Major on 1 Mar. 1864. He was mustered out on 04 October 1864. Mary Elizabeth EDWARDS older sister of Cornelia. She married Eli BROOKS & moved to Iowa. Katherine "Kate" EDWARDS older sister of Cornelia. She married Eurebus A. "Sebe" RUSSELL. Eurebus A. "Sebe" RUSSELL husband of Kate EDWARDS enlisted, 20 September 1861, B Co. 2nd Cav Reg. IN. Promoted to Full Qtr Master Serg. Transferred from Company B to Company S & was mustered out on 04 October 1864. Robert EDWARDS older brother of Cornelia. Charles EDWARDS older brother to Cornelia, ran the family farm during the war. Simpson BROOKS son of Mary Elizabeth & Eli BROOKS. He spent some time in IN, with the EDWARDS.